I squinted in the dark. My heart raced as I turned to my husband beside me in bed. “What do you see?” My voice was a choked whisper. “There’s a girl there—there in the bay window. She’s dressed in white.” All I could see was black night and a few stars through the skylight. Something wasn’t right: My husband doesn’t believe in ghosts. “Maybe it’s a dream.” My voice was thin. “I’ve closed my eyes twice, but she’s still there,” came his reply. Only the courageous could sleep after that. I tossed fitfully, but Terry fell into a deep slumber. The next morning, he explained that the ghost had been sweet and smiling, almost like she was happy and telling him so. He was content; I was nervous. What did this spirit want? 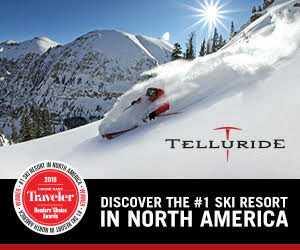 It is one thing to believe, like I do, that many spirits haunt Telluride. After all, the Utes spent ten thousand years in the valley only to be driven out by prospectors in the 1880s. Miners swarmed from 25 different countries to seek their fortunes, bringing with them superstitions and lurid tales of tommyknockers and evil. Their lives were fraught with danger, violence and heated emotions. They were ousted first by the hard times of the 1920s through the ’40s, and then by a new wave of young counterculture “immigrants” when the ski area was developed in the 1970s. These changes were abrupt and traumatic. No wonder spirits from those transitions could not rest. It was 2 a.m. when I raced to the Telluride Historical Museum to meet the alarm company representatives and a Telluride marshal. We tromped through the snow looking for evidence of a break-in, and then entered the building, a former miners’ hospital. During the day, the old hospital’s past—deaths, accidents, sorrows—seemed dim, but this night every shadowy space was crowded with phantoms. I followed the police into the room where the woven basket coffin, which had held injured or dead miners as they were carried down the mountain, was propped. Our search revealed nothing missing, nothing amiss. What tripped the alarm? I fidgeted the rest of the night and the following day at my job as the museum’s director. When the alarm raised us all at 11 p.m. the next night, I faced the search with trepidation. This was frightening: Some unseen, unknown force was triggering the alarm. Once again, the chilly black spaces provoked goose bumps and a pounding heart, but there wasn’t a trace of anything. The alarm specialists agreed to meet with me the next morning for a thorough investigation. The museum building had been recently restored, and hospital artifacts had been moved carefully off premises during rebuilding. I was leading the charge to reintroduce treasures to tell Telluride’s story in exhibits, but at this time, the building was virtually empty. Only one exhibit about healthcare was installed. Board member Carol Kammer had been searching for an x-ray of a lung with scars from silicosis, also known as “miners’ consumption.” No one wanted to donate the x-ray: Miners’ consumption is a fatal condition that resulted from inhaling dust and shards of rock and was a stigma to a miner and his family. But Carol had prevailed and found a doctor in Arizona who forwarded an x-ray for our antique x-ray machine. When I greeted the alarm company representatives the next morning, they asked if I had done anything differently in the section of the museum where the alarm had registered. I couldn’t think of a thing. But wait a minute! The x-ray had arrived the day of the first alarm. I had loaded it in the machine, turned it on to make sure the image was clear, and then turned it off and unplugged it. How could that have set off an alarm? One young man from the alarm company told me that his grandfather had died from miner’s consumption and been ashamed of the disease until the end. How many miners had suffered in this very hospital in the same way? How many had felt it the gravest sign of weakness to die from scarred lungs? Would any of their spirits protest the x-ray by haunting the museum? We never did explain the alarms, but after we discussed the terrible disease with compassion for its victims and my desire to share the story of their suffering through the x-ray exhibit, the alarms ceased. Not all ghosts are wispy phantoms or alarms. For years, I led schoolchildren on tours of the local Lone Tree Cemetery. We always started at the first burial site, where Edwin S. Andrus was laid to rest. I’d heard that he was the son of George Andrus, the man who had sold some of his land for the cemetery. More research unfolded that George Savage Andrus was an assayer and superintendent of the Pandora Mill and owned four acres of land, known as the St. James Placer, during Telluride’s early settlement. He was one of the founders of the Masons of Telluride, and his wife, Mary, raised funds for the first church built here. From newspapers, town histories and headstones, I put the story together. The epitaph on their child’s grave states that he was one year, seven months and 11 days old when he died. No cause of death is indicated, but health conditions were poor in those days. Many children were susceptible to scarlet fever, whooping cough or pneumonia. I wished I had found a photograph in my research, but the possibility of a picture surviving from the 1880s was slim. I imagined that grief for his boy inspired Andrus to sell the St. James Placer to the Town of Telluride for use as a burial ground. I told that story to hundreds of children over the years as we gazed at the tiny, unassuming headstone.